Home » Help us in supporting Backpacks 4 Kids this year! Its hard to believe, but the new school year is just around the corner and its time to start thinking about “Back to School” shopping. Many children look forward to starting school year with a brand new backpack and school supplies, but for families who can’t afford to purchase these items, it can be a challenging time. We are proud to announce that we are once again partnering with NBC4 and Apple Federal Credit Union to collect backpacks and school supplies for local kids right here in our area. 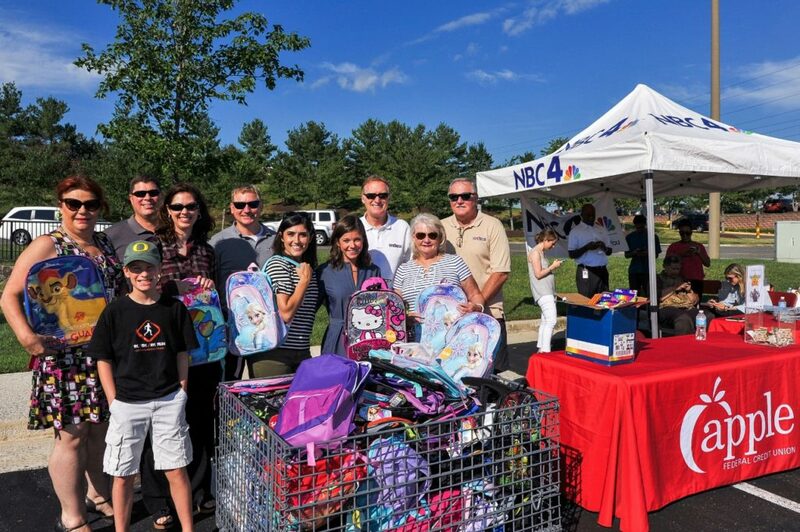 The crew from NBC4, including news anchor Erika Gonzalez, will be on-site at the Kingstowne Apple Federal Credit Union (6831 Sir Viceroy Drive, Alexandria, VA 22315) on Thursday, August 3rd from 6 am to 12 pm to collect donations that will be distributed out to those who need them the most. Our team will be dropping off supplies on 8/3, and would love to see you all there! If you can’t make it then, you can drop off donations at our office (and we’ll take them over for you) or any Apple Federal Credit Union branch in Fairfax County. You can also make a secure donation online at either NBC4 or AFCU. Thinking of buying or selling a home in the fall? Give us a call at 703-822-0207 or e-mail us anytime at tomandcindy@hellovirginia.com.